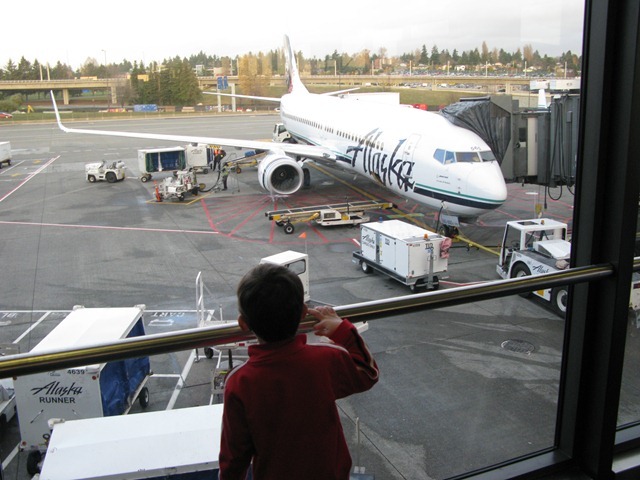 We arrived at Seattle-Tacoma airport two hours early for our flight to Kauai. On this particular Sunday before Thanksgiving, the crowds were thin. It was still good to have plenty of time with so much luggage and two kids. We took the subway to the N concourse, the same place I'd started my three-week vacation to Europe 10 years ago. Both boys were so excited, they were asking questions about everything. And Brenda's plan of having the boys pull their own luggage was working. They were also both wearing red sweat suits (which we thought would help with tracking them--and, no, I don't think Brenda has seen The Royal Tenenbaums). When we got to the gate, passengers were disembarking from the sleek Boeing 737-800. 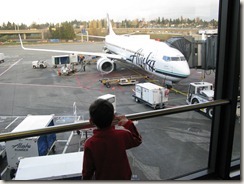 Drew walked up to the window and stared out at the airplane. A little later, we ended up meeting the co-pilot for our flight, who was sitting next to us in the waiting area. 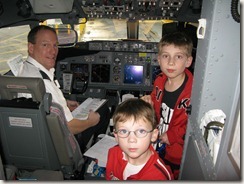 He invited Cameron and Drew into the cockpit during boarding. 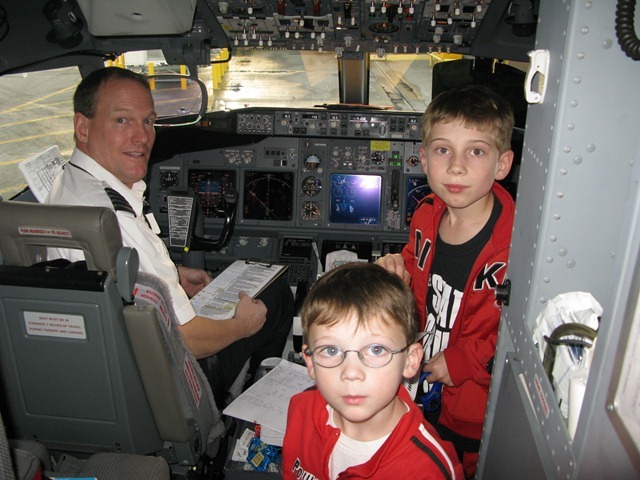 Sure enough, when we got on board, the pilot and co-pilot welcomed the boys into the cockpit. They even let Cameron sit in the co-pilot's seat! One interesting thing the co-pilot told me was that the winglets (those tails on the end of wings) on the 737-800 help with fuel efficiency. Evidently, just having those 8-foot winglets reduces vortex drag (those little tornados you sometimes see coming off the wings of airplanes). I asked if he could tell the difference when flying an aircraft with winglets and one without. He said the ones with winglets take longer to slow down and "want to stay up in the air." After that, we took our seats and waited to take off. Brenda, Drew, and Cameron sat on one side of the plane, and I sat across the aisle.